Last December, I attended a baby shower for my sister-in-law, Jessica. I sampled a little bit of heaven that night in the form of an Oreo truffle. What surprised me the most was the fact that the recipe only called for 3 ingredients. 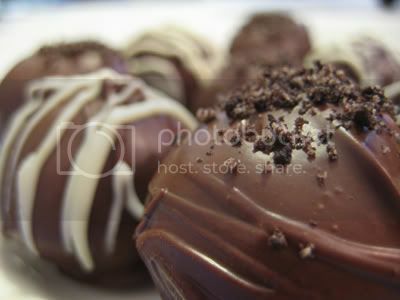 Since that evening, I have made Oreo truffles dozens of times. They are delicious! And since this recipe didn't originate from me, I can say that and not even feel prideful. The second best thing about this recipe (besides the fact that only 3 ingredients are needed) is that it is fool proof. Yes, it is that easy! I have had so many requests for the "secret formula" that I decided to post the recipe on my blog for the world to see! Get your pens and paper! You won't regret it. 2. Crush remaining 36 cookies to fine crumbs; place in medium bowl. 4. Roll cookie mixture into 42 balls, about 1-inch in diameter. 5. Melt chocolate according to directions on package (microwave is easiest). 7. Sprinkle with reserved cookie crumbs. 8. Refrigerate until firm, about 1 hour. Store leftover truffles, covered, in refrigerator. ahhhh - you're starting to post :) i'll be checking back. I love these truffles, i make them at Christmas. This a very good recipe, I tried this at home and my family loved it. These are my favorite. I make them all the time. Yummy!